March 16, 2018, 10:06 a.m. Within the first three months of this year, the four-year-old news company brought a tech site and a top site for sports fans under its umbrella in order to grow its overall reach. By Alan Soon March 16, 2018, 10:06 a.m.
Just three months into the year, The News Lens, itself a news startup, had already acquired two separate Chinese-language sites: a tech site, Inside, and a site for sports fans, Sports Vision. Chung’s goal, he said, is for the News Lens family to include five or six sub-brands by the end of this year. 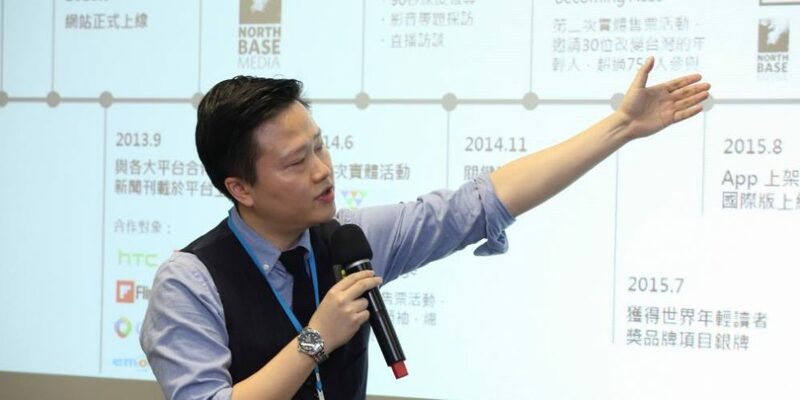 Chung, an MBA without previous journalism experience, and his co-founder Mario Yang, a longtime tech and business journalist based in Taiwan, launched The News Lens about four years ago, seizing on what they saw as an opportunity to build an independent news startup in Taiwan’s politicized and polarized media market. They funded the site’s first year with their savings. The News Lens is based in Taipei, with an additional office in Hong Kong. Today, it publishes Chinese-language editions for Taiwan, as well as for audiences in Hong Kong and Southeast Asia, and has an English-language site targeting international readers (after Taiwan and Hong Kong, the U.S. is The News Lens’s third biggest market). 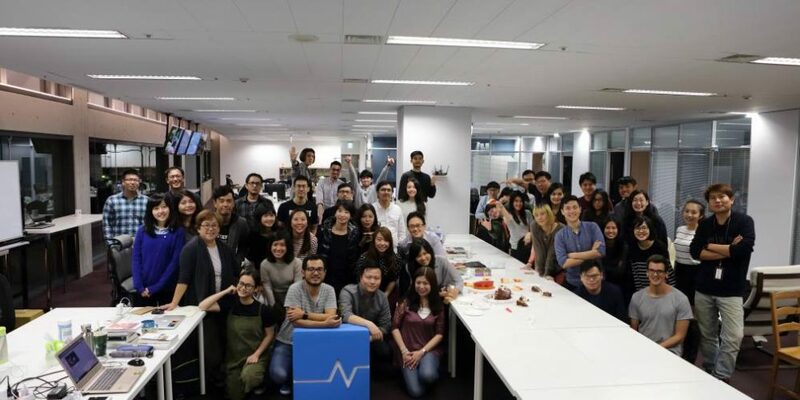 Around 75 people work out of its Taipei office, plus another eight in Hong Kong, and Chung is quick to point out that “the average age of our employees is around late 20s or early 30s.” The company claims about 7 million unique monthly visitors. It closed a $2 million Series B round last March, followed by a flurry of new partnerships and investors. Seventy percent of the company’s revenue comes from advertising, and the rest from events and licensing deals. It’s also considering a membership plan this year. My full conversation with Chung about the growth strategies of The News Lens, edited slightly for length and clarity, is below. Alan Soon: Let’s start with how you’ve built this business. You’re not a journalist by training. How would you describe your career path so far? Joey Chung: After college, I went to the U.S. for business school, so I was going down the post-MBA career path. I interned for Polo Ralph Lauren in New York. I worked for Sanrio, the Japanese media company that owns Hello Kitty. I worked in San Francisco for a year. I was sent to LA for a year, and then the company sent me to Shanghai for two years, where I was GM of the China office. By the end of the fourth year, it was time for a change. The good thing about a Japanese company is if you don’t really do anything wrong, you can stay there for the rest of your career. But it was my first job. I thought it was a little bit too early to be thinking about staying someplace safe until retirement. On one of the weekends, I flew back to Taipei. I knew Mario because he was in charge of online content for a business weekly in Taiwan. I wrote a few books that were published by the Business Weekly, and I occasionally wrote columns for them too. I decided it was time to leave my job. Do I go into financial services? Should I go back to the U.S.? Should I go to Hong Kong or Singapore? So Mario and I were talking about the media environment in general. In Taiwan, the running joke is that the media industry is probably one of the most hated industries because it’s very political, very left or right, or very sensational. Mario was thinking about this too, but he thought about it from a content standpoint since he’s an editor. I was thinking about it from a startup standpoint. What’s the valuation? How do you find investors? We brainstormed this for maybe 30 minutes and at the end, I was going to fly back to Shanghai, so we agreed to sleep on this for a month. In the meantime, we’d talk to people we know, and we’d do some research. We looked up every single thing about digital media, and whoever came before us — why did they fail in Taiwan and Hong Kong? We did this for a month. We agreed that if at the end of one month we found just one reason as to why it would absolutely fail, I’d continue down my corporate road, and he’d continue being an editor. I didn’t find one absolute reason from a business standpoint that I thought meant we definitely shouldn’t do this. Soon: When you were looking up case studies and what was out there, what did you look to as a reference — either inspiration, or something you knew you definitely weren’t going to do? Chung: Most of the successful case studies for digital media startups at that time were from the U.S. So we followed The Huffington Post, TechCrunch, and the other new media companies that were emerging at that time. But in Hong Kong or Taiwan, our population is one-twentieth that of the U.S. We have a harder time persuading people to pay for content. The key finding for us was that most of the previous digital media startups in this region failed. They were usually started by someone in their 40s or 50s, who left legacy media — the person ran a newspaper or used to run a big media company, had some money, had very good credibility, and left to start their own digital media startup. But that was also part of the problem. You may have a much higher burn rate to start a business, but strategically, you’re treating your new business from a traditional publishing standpoint. You’re treating a startup like legacy media, except it’s online. That was our biggest warning. We didn’t want that. We didn’t need a fancy office; no fancy Macs. We weren’t going to spend any money until we were sure we could eventually catch up. We didn’t want to burn $2 million in our first year. It’s all about suffering, because you basically have to use as little money as possible, and just as fast, build up your audience. Soon: Your advice for anyone entering this space with such a model is to keep costs as low as possible, so you can get to the point of having size and scale? Chung: Well, yes, but there are exceptions to this. Number one, if you’re seeded, or if you were launched by a huge legacy media company, that’s a different story. They might care about burning cash to get the market share right. That’s kind of like Uber. But if you really want to be an independent media company, then the faster you self-sustain, the better. I didn’t want to be at the mercy of my investors. Soon: Were you fully self-funded for the first year? Chung: Yes. All of the startup capital came from the savings of my partner and me. It was meant to last us 18 months. The idea was that if we couldn’t get to a certain scale where we could attract outside investors or self-sustain in 18 months, then we’d give up on this. Soon: What was the first role you hired for? Chung: On day one, we had three people in the office. My partner Mario did all the content, I handled all the operations, and a tech person basically created the whole website. Soon: When did you realize it was time to add writers and reporters and salespeople? Chung: The website went live about 40 days after we started work. At the end of the first month after the website went live, we hired our first editor. I’d say for the first six to nine months, don’t even worry about hiring sales. There’s no point in hiring sales when you don’t have enough of an audience base yet. We didn’t hire our first salesperson until we were about a year old. By then, we had about two million monthly unique readers. I personally handled everything else that I could — payroll, banking, operations, partnerships, free marketing, that kind of thing. Soon: So when did you go for a seed round? When did you realize that’s what you needed? Chung: That was seven months after we launched. We were always actively thinking about it. I mean, if you have cash flow and burn rates where you have 18 months ahead of you, then to be safe, you should be able to score or secure your first outside investment by the end of 12 months. That process itself takes about three to four months. You don’t want to be in the last month of cash flow and about to run out. Logically, if you have 18 months, you need to know where you are by month 12. By month three, when we passed one million monthly uniques and were headed toward two million, things started getting a little interesting for us. That’s when the outside VCs or angel investors start noticing, and they start coming to you and gauging your interest for outside investments. At least in this region, many of the early investors who would find you are the people who are most interested in a media company. So early on, these are the same people — huge families and huge conglomerates — that have some kind of agenda. My job is to get the best valuation for the company. And as an independent media company, your best valuation most likely comes from an investor or the group that has the most to gain from owning a digital media company. That’s the irony: You’re often forced to take the worst valuation, because that usually comes from a person who understands media but has no agenda, so therefore won’t give you a premium. Soon: When did you start the Hong Kong operations? Chung: Around the end of year two. We have a team there now, but initially it was just one person working from home. It’s seven to eight people now, still very small. So everything we can do in Taipei, we’ll do — IT, accounting, accounts payable. Hong Kong is just too expensive. The Hong Kong team is editors and one social media manager; they create content for the Hong Kong market. Everything else is in Taipei. Soon: How do you think about about expansion? You have Hong Kong, a Southeast Asia edition, and an English-language international edition. What made you want to expand outside of Taiwan? Chung: It just seemed like a natural next step. While running the Taiwan edition, Occupy Central in Hong Kong happened, and that’s how we knew we had a lot of readers from Hong Kong. They didn’t trust their own media, because a lot of Hong Kong newspapers are owned by huge families or businesses that are either pro-China or anti-China. So when we said we’re from Taiwan, that was a good thing. We decided to experiment with Southeast Asia because of the economic growth in that region. We don’t have an office there — we run that edition out of Taiwan. And we also realized that after Taiwan and Hong Kong, the U.S. was our third biggest market. If you look at where the overseas Chinese are — U.S., Canada, UK, Australia — we have about half a million readers per month from these territories. So an English-language edition was a logical next step. The English edition is overseen by two people. It’s almost like a feeder site to convert overseas Chinese people into becoming our readers. I’m perfectly fine if they find us first through English, and that links them to the mother site. Soon: Tell me about the acquisition of the tech site Inside earlier this year. How did you come to that decision? Chung: By 2017, we were hitting our peak in terms of traffic. If you do the math, we were close to the ceiling. When you look at legacy media in Taiwan — Dongsen, Sanli, Apple Daily — they average 10 to 13 million monthly uniques. That’s mass media, with their fluff pieces. We don’t have any of that, so we knew we weren’t going to be bigger than them. But we have international investors. We’re run much like a startup; this isn’t a mom-and-pop store. So we knew we needed to keep growing. There are two ways: International expansion, which we’ve been doing for two years, but that’s slow and expensive. The other way is verticals — like the Vox model in the U.S.
We first started having these conversations in the summer of 2017. I had a list of the top tech sites, the top female interest sites, the top sports sites for Taiwan, Hong Kong, Southeast Asia or Greater China. The Inside deal was our first one — they’re among the top three tech sites in Taiwan and have 1 to 1.5 million monthly unique readers. We didn’t have anything in terms of tech at The News Lens. It would’ve taken us at least two years to build that. It’s also necessary for digital media to consolidate — you can’t have five different tech sites for one market like Taiwan. Everyone would be losing money and burning cash. Soon: What about your latest acquisition, Sports Vision? How does that fit? Chung: We just closed the acquisition for Sports Vision. We took full operational control on March 1. They’re in a very similar situation to Inside. They have five to six employees, and they’re about three years old. They cover all sports, from Japanese baseball to soccer. They’re the second biggest digital media sports startup here, but they cover the entire world. The top sports site was actually focused on marathons and running — too niche for us. So with all these acquisitions added in, we’re getting to eight to 10 million uniques. We’re edging closer to legacy media size. By the end of this year, I want to have five or six different sub-brands. The common theme is that the spirit and brand equity is all the same: no bias, nothing sensational or trivial, trustworthy, and newsworthy. Soon: What do you lose sleep over these days? Chung: In year four, I am forever stressed out, except I don’t feel it any more because it’s every day. Stressed out is my normal now. I think, can we grow and hit our sales target this year, without selling our soul? When will we find new investors that will recognize the valuation, without trying to kill us? The underlying theme: Are we getting there? Are we getting safer, or more stable? I don’t want to make a wrong step. I don’t want to piss off the wrong people. I need to be very, very careful. As the stakes get bigger and bigger, all of a sudden something’s going to come from left field. You’re constantly worried that someone’s going to come in and kill you from behind, so only the paranoid survive. A version of this interview was first published in Splice Newsroom. Photographs of Joey Chung and The News Lens newsroom in Taipei, Taiwan courtesy of The News Lens. 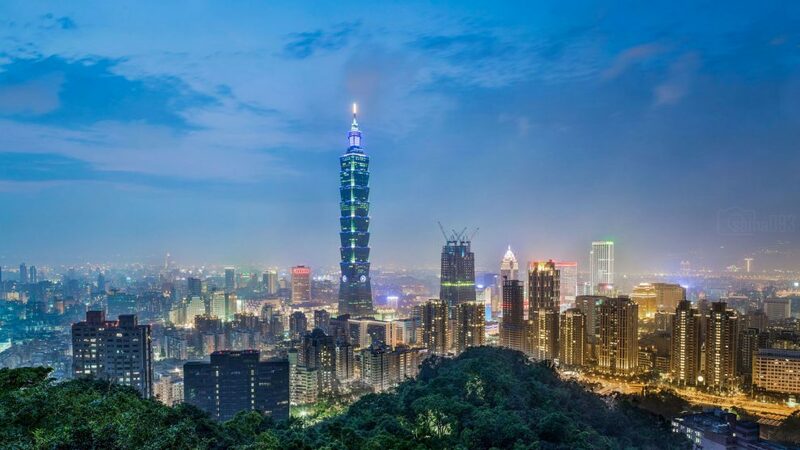 Image of the Taipei skyline by sama093, used under a Creative Commons license. POSTED March 16, 2018, 10:06 a.m. Soon, Alan. "The News Lens in Taiwan is doing what media startups in the region hesitate to do — acquiring other sites." Nieman Journalism Lab. Nieman Foundation for Journalism at Harvard, 16 Mar. 2018. Web. 23 Apr. 2019. Soon, Alan. "The News Lens in Taiwan is doing what media startups in the region hesitate to do — acquiring other sites." Nieman Journalism Lab. Last modified March 16, 2018. Accessed April 23, 2019. https://www.niemanlab.org/2018/03/the-news-lens-in-taiwan-is-doing-what-media-startups-in-the-region-hesitate-to-do-acquiring-other-sites/.